If you are friends with me on Foursquare, Instagram, or Twitter, you would probably gather that I stop at Basilico's Pizzeria in Dickson City quite often even though my hobby is driving all over NEPA to review different pizzas. Why do I frequent there so much? Well, quite frankly, it is my favorite pizza and I happen to be in the Dickson City area at least once per week. Although it happens to be my favorite, I believe I can still be objective (as shown by Basilico's not being my Top Pizza in NEPA 2012). In addition, I have more than 98 other pizzas that I've written about to compare it to! Having that in mind, I have been aware for a couple months that Basilico's had opened a new location in Dunmore which I've been very excited to get to. I finally decided to make the trek to check out Basilico's Pizzeria Express, which is a little different than the Dickson City Location. Since the place is a little different, but I already reviewed the Dickson City store, I decided to handle this review a little different by doing my normal secret shopper review, then following up by contacting the owner for a mini interview afterward. Note: This pizzeria is still in business, but under a different name. I believe they have all of the same (or similar) recipes, however. So let's work backwards and start with what I found out in my phone interview with Basilico's owner, Pete Montana. When I called Mr. Montana, he was very eager to talk pizza and to share his story about his inspiration to open the Dunmore location. In planning to open the new store, he wanted to develop a high quality, express pizzeria that offers delivery, take out, or a quick dine in, that is not from a chain restaurant. We all know that the most popular way to get pizza delivered to your door is usually by large chains who offer a decent pizza at a value price, so Basilico's Express sort of breaks that mold a bit here in the area. When I asked Mr. Montana to compare the Dunmore store to Dickson City, he said he wanted to "keep it clean, simple, and fun" with the new place and serve high quality pizza rather than the full menu that Dickson City offers. In visiting the store, I must say that his vision is a reality. When I walked in, I noticed that the dining area and kitchen were immaculately clean, the service was quick and the whole experience was simple and fun. 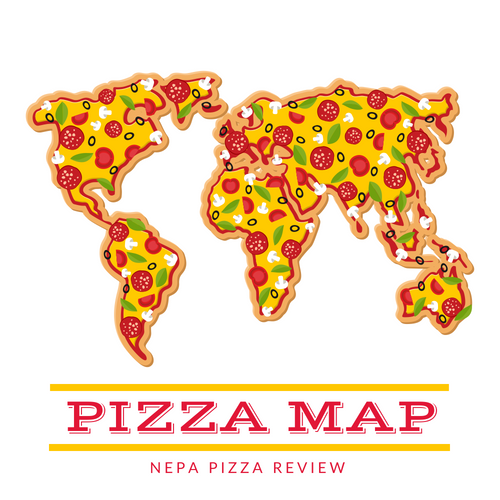 The place just made sense to me as I'm a person who is always on the go, but looking for a high quality slice of pizza. 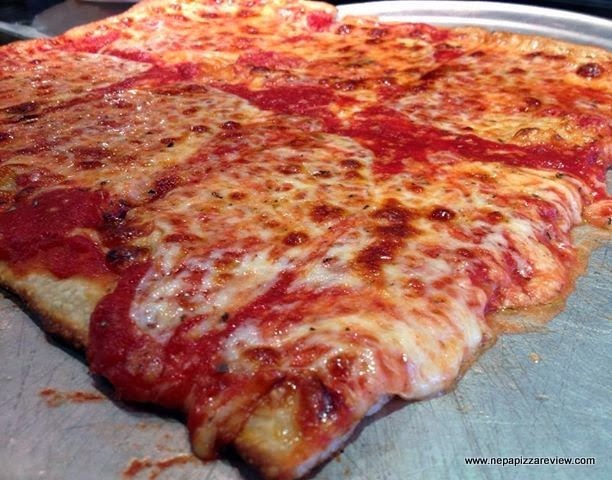 Speaking of high quality slices of pizza, I have seen photos on Basilico's facebook page regarding the new "Dunmore Square" pizza which was developed exclusively for the Dunmore location. The owner wanted to have a special pizza named after the town to celebrate the opening and give Dunmore residents something they would enjoy. The pizza starts with a "Grandma" crust which is essentially a very thin Sicilian crust. The crust is thinner than an Old Forge crust, and is wonderfully crispy. The specially made sauce is sweet, but not too sweet - and given that Dunmorians tend to enjoy a sweeter sauce, I'd say this is a great fit for the town. The tomatoes in the sauce were so important to this pizza, that Mr. Montana flew all the way across the country to California to see where they were grown. It's amazing to know that he would go to such great lengths to develop a pizza! On top of the sauce is a variety of other ingredients that pack a ton of flavor, but we need to leave something to the imagination so I'll just mention that there is a very sharp provolone cheese mixed with some grande mozzarella on top which just creates an amazing taste and texture experience. Overall, I really enjoyed this slice of pizza as a change of pace from traditional offerings in the area. If you are looking for a high quality pizza, or you are from Dunmore and want to try the pizza specially designed for you, I recommend you order up a slice! Overall, I was definitely impressed with the new Basilico's location and different business model. It's a great location, a simple premise, and offers quick dine in, take out or delivery options. If you are a fan of truly great pizza and are willing to pay a slight premium for the high end ingredients, I encourage you to give Basilico's Pizza Express a try! You won't be sorry. Please use the comment section below to let me know your thoughts on Basilico's!